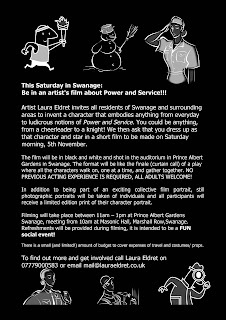 Artist Laura Eldret invites all residents of Swanage and surrounding areas to take part in an exciting new film artwork exploring notions of Power and Service. Individuals are invited to attend one of two creative introduction workshops led by the artist, she will introduce the story behind the art project, past examples of her work and initial ideas. Though in fact the intention is to inspire participants imaginations to invent and develop their own personal characters to dress up as or act as in the final film. The intention is that the cast of characters (participants) will embody anything from biblical to ludicrous notions of Power and Service, from a cheerleader to a man walking a dog. Participants will then present themselves acting their character in a short film of all the participants, shot on the morning of 5th November in Prince Albert Gardens, Swanage. In addition to being part of a collective film portrait, individual photographic portraits will be taken and all participants will receive a copy of their character portrait. No previous acting experience is required, all adults welcome! Refreshments will be provided at the meetings and during the filming, and it is intended to be a fun social event! There is a small amount of budget to cover individuals' expenses of parking/travel and costumes/ props. This is part of the project A Tale of Two Occurrences that is Arts Council England funded. With special thanks to Lesson House, Swanage Town Council and Dorset County Council Arts Team for their support in kind and advice. The recent Swanage Blues Festival was the 16th that I have organised. 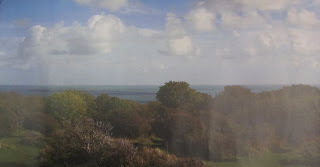 If you go to www.swanage-blues.org, then Past Festivals, and finally "2011 October" - you can read what people thought about Swanage and the last blues festival on 7, 8, 9 October. Council Tax blow for second home owners. I see there's a 'Sale Agreed' sign in the Sea Salt window. Anyone know who's taking over the lease? Royal Victoria Hotel Grade II listed building ignored by planners? There seems to be various advertising and new doors appearing on this one time revered building -but no enforcement. Is some official going to make the landlord of the East Bar take down his plastic first floor advertising board, before it's been there four years, and he no longer has to reinstate the balcony? See link above for grants up to £7,500 available from Dorset County Council. Dorset County Council recognises and values the potential of organisations of all sizes working across Dorset to deliver outcomes for the communities they serve. The Dorset County Community Fund has been set up to build the capacity of the voluntary and community sector and parish and town councils in order to deliver stronger services and support for local communities. The fund will be open for applications from the 18th October 2011 and the closing date for the first round of applications is the 6th January 2012.Applicants will be notified of the outcome after the 27th January 2012. The next round will open to applications on 1st February 2012. Scheduled meetings of Swanage Town Council. 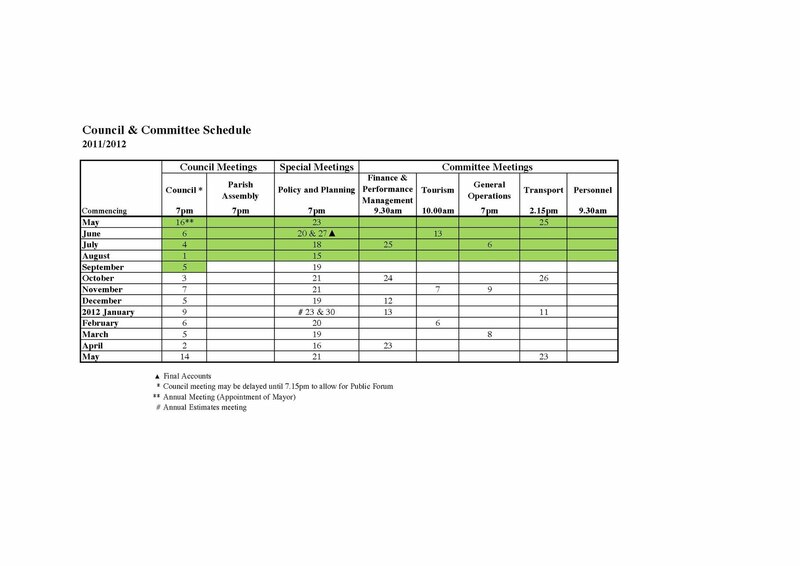 Note that meetings are sometimes re-scheduled, so if you are interested in a particular meeting, it's worth checking it's on the scheduled date. 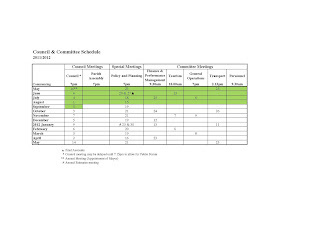 You should be able to see agendas amd supporting papers on the Council website (link above). Evening meetings. Note that a number of meetings are now held in the evenings - so if you are among those who campaigned for this, so that more people could attend after work, please go along, before they are suspended again owing to lack of interest. Congratulations to everyone at Education Swanage, for their success in being approved by the government to open a new Free School in Swanage. This is from their Facebook page (more on the link above). "Just a quick note to let everyone know the fantastic news - the Swanage School proposals have been accepted and we'll be opening a brand new secondary school in Swanage in September 2013! Huge thanks to everyone who's been so supportive of Education Swanage over the past months and years. There's a lot of hard work to come, but our mantra has always been 'a school created by the community for the community' and we know that together we will do something truly amazing for local children. Keep your eyes peeled for news of a public meeting to be held very soon!" read the words written in "great nature's open book"
See sights that say "St Anne's of Soho"
Go loco on the "Wessex Belle"
Should tourists contribute to improving transport infrastructure in Purbeck? This is NOT a general public meeting for everyone, but for those representing organisations working in tourism. Purbeck District Council are exploring whether tourists should provide a contribution to improvements to transport infrastructure in Purbeck and would value your input at a workshop on Wednesday 12 October 2011 at Morden Village Hall. Currently only new development, e.g. houses, is required to contribute to transport infrastructure, but the Council is considering expanding the policy to generate income from tourists who visit Purbeck by car and add pressure to the road network. This is not a full consultation but a workshop to get feedback from representatives from the tourism sector as to whether these preliminary proposals could work in practice. If you are the appropriate person in your organisation to attend please pass this invitation on. There will be a fundraising dinner on 13 October at Windjammers Restaurant in the High Street. Tickets to this three course repast are a very reasonable £20 which includes a £5 donation to Heroes Haven. Time is 6.30 for 7 pm. This is a chance to have an evening out and put something into a good cause. Tickets ave available from Windjammers and from Georgian Gems. Interesting presentation from Eneco to the Town Council last night. Most striking thing was the revelation that there is NO room for any significant negotiation on the siting of the turbines. They will be placed in the area shown, not anywhere else on the larger zone, as most people believed is what they had been told. Visuals can be seen at the Gazette offices (though I've placed copies here, but not very easy to see online). A UTube item is of local interest at:- http://youtu.be/BccKamCyTr0 Poole Flying Boats during WW2.